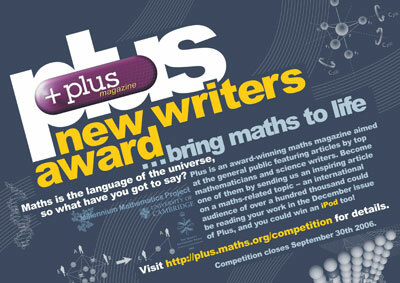 Plus new writers award - Maths is the language of the universe, so what have you got to say? Reader's corner - 6174 and other mysterious numbers. World Cup maths - How Plus can help you with your football. Maths is the language of the universe, so what have you got to say? Here at Plus we try to open a window to the world of maths, with all its beauty and applications, by providing articles from the top mathematicians and science writers on topics as diverse as art, medicine, cosmology and sport. But many people in the general public, and the mainstream media, are still unconvinced of the relevance of mathematics to our daily lives. So this year we are holding the inaugural Plus new writers award, to find the people who can bring mathematics to life. The competition is open to new writers of any age and from any background who can explain a mathematical topic or application they think the public needs to know about. "It was people telling the big mathematical stories that made me realise at school that there was much more to maths than simple long division," says Marcus du Sautoy, author of the best-selling book The music of the primes and one of the judges of the Plus new writers award. "Reading these stories inspired me to want to make my own mathematical breakthroughs. The future of mathematics depends on capturing the imaginations of those who will become the next generation of mathematicians." Also judging the competition are John D. Barrow, director of the Millennium Mathematics Project and author of many successful books and plays on mathematics, and Helen Joyce, ex-editor of Plus and now a correspondent for The Economist. There are two categories: secondary school students and the general public. The winning entries will be read by an international audience of over a hundred thousand in the December issue of Plus, and the winners will receive an iPod and signed copies of popular maths books by some of the best science writers today. The closing date is September 30th 2006, so if you think you can share your passion for maths with the general public, download your entry pack today and get writing!! Yutaka Nishiyama's article from our last issue, Mysterious number 6174, has proved to be very popular with readers around the world. The article has been mentioned in various blogs and websites, including digg.com and the Chicago Tribune. It has also led many Plus readers to explore the mysteries of Kaprekar's operations themselves. The same things happened with the kernels for Kaprekar's operations for any number of digits they checked. Professor Nishiyama has provided an explanation why this happens: it is because the result of performing Kaprekar's operation on any number is a multiple of 9. So applying Kaprekar's operation always results in a number that is divisible by 9. We see that this number is divisible by 9 if and only if (p+q+r+s) is. So by repeatedly summing the digits of a number divisible by 9, the result at each step will be divisible by 9, until you are just left with the single digit: 9. As one reader said: 9 turns out to be a pretty mysterious number too! One of our readers has sent in the following riddle. He has wrecked his brain, and so has the Plus team, but so far to no avail. If you do come up with an answer, then please share it with us by emailing plus@maths.cam.ac.uk. I am an island, a snake, a bee and a net. I am in all of these, but you can only catch me on one. When you catch me, the combination to unlock me is 14 116 14 82 8 and the secret is within. The football World Cup is upon us again. Millions of people all over the world will spend the next few weeks glued to their TV sets and stuck in pubs, flitting between pure ecstasy and extreme pain. But, emotive as the beautiful game may be, and even though God does put a hand in every now and again, in the end, believe it or not, it all comes down to maths. Does you team have a better chance of winning if they score early in the match? What's the best strategy for a penalty kick? And what are the secrets behind the players' team numbers? The following articles from the Plus archive have answers to all this and more. Whether you want to impress your mates down the pub, or simply need some intellectual stimulation to make the next few weeks bearable, now is the time to get reading.